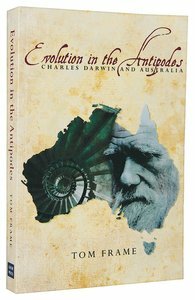 Charles Darwin's profound influence on Australian thinking is explored from a variety of positions in this carefully researched analysis. Providing useful contextual material on Darwin's life and times, including his 1836 visit to Australia in the HMS "Beagle," the narrative examines historic disputes and contemporary debates about Darwin's motivations and methods. This reference also displays his scientific conclusions and their social consequences while outlining the various ways in which Darwin's work continues to shape Australian public policy and private behavior. About "Evolution in the Antipodes: Charles Darwin and Australia"
Bishop Tom Frame was born at Sydney in 1962. He joined the RAN College, HMAS Creswell, as a 16-year old cadet midshipman in January 1979. After serving as Research Officer to the Chief of Naval Staff and completing a PhD on the HMAS Voyager disaster, he resigned from the RAN in late 1992 to complete a Masters degree in theology and training for the Anglican priesthood. Ordained in 1993, he held parish appointments in Australia and England. He was Bishop to the Australian Defence Force from 2001-07, a Visiting Fellow in the School of Astronomy and Astrophysics at the Australian National University (1999-2003) and Patron of the Armed Forces Federation of Australia (2002-06). He has been a member of the Council of the Australian War Memorial since 2004.Bishop Frame is the author or editor of twenty books including A Church for a Nation: A History of the Diocese of Canberra & Goulburn; Church and State: Australias Imaginary Wall; Anglicanism in Australia: A History (edited with Bruce Kaye, Colin Holden and Geoffrey Treloar),A Church for aNation, LIving by the Sword? The Ethics of Armed Intervention and Agendas for Australian Anglicanism: Essays in Honour of Bruce Kaye (edited with Geoffrey Treloar). He has been Director of St Marks National Theological Centre, Associate Professor and Head of the School of Theology, Charles Sturt University since January 2007. Bishop Frame is married to Helen and lives in Canberra.